wonder if you have weighed the pros and cons of switching to pellet/wood stoves for heat this winter? I live in Montana and our heating bills are slated to rise 50%, yes 50% this winter, partially due to the sale of Montana Power to Northwest Energy. Our heating bills (gas for heat and cooking and electric for the usual) get as high as $600 a month in the winter. Liz, unless you have a very cheap source for a high volume of wood, installing wood heating options won’t save you any money for a very long time. In order to install an indoor wood stove, a fireplace, or an outdoor wood boiler, you have to have a chimney and a blower, which can cost thousands to install. Even if you already have the equipment, without a supply of very inexpensive wood, you won’t do too well. How much does it cost, exactly? The calculation of how much wood you need is pretty simple. For many homes, the amount of wood you’ll need to replace your other heating is somewhere between three and six cords. A cord of wood costs roughly $150-200 just for the wood, and weighs about 5,600 pounds (2,500 kilograms). You can usually tack on another $50 or so per cord for delivery cost, so the cost of getting that much wood delivered would be about $250 a cord. Thus, your wood cost alone (if you don’t have your own source) is about $1,000 for the winter. That doesn’t include the effort of hauling in wood and so on. So, unless you have a very cheap source of wood (your own chainsaw and a small forest out back) and are already set up for it, a wood stove is not a good solution for heating. Incidentally, my father uses a wood stove to heat his garage and goes through probably 50% of a cord each winter. He has a lot of trees nearby and cuts the wood himself for his own use. This makes sense for him because the effort to cut the wood for the stove is not immense, plus he is already set up for it. Given that, what actions can Liz take? One sure way to have inflated heating bills is to continually lose heat to the cold outdoors. You can easily reduce this loss of heat by carefully air sealing your home. The Department of Energy’s office of Energy Efficiency and Renewable Energy has a wonderfully useful guide to air sealing an existing home, including walkthroughs on how to detect air leaks and how to caulk and weatherstrip any leaks you do detect. Doing this can save as much as 30% on your heating bill. Since heat rises, it’s not surprising that quite a bit of heat is lost through the roof of your home, hence the need for significant insulation in your attic. Take a peek up there and make sure there’s plenty of insulation to go around. Also, if you can, check the insulation in other ceilings, exterior and basement walls, floors, and crawl spaces. Here’s an excellent EERE guide on home insulation. Why keep the house at a high temperature when you can just toss on an extra sweatshirt instead? Lower your home’s temperature a bit and cuddle up with a blanket – you’ll be toasty warm and you aren’t burning money to keep other parts of your home warm. 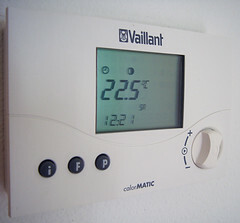 Get a programmable thermostat. A programmable thermostat can automatically lower the temperature of your home at night and when you’re at work, making the heat run less when you’re not actively using it. Such a device can pay for itself in a season, making it well worth the investment. If you have a vent fan in your kitchen to eliminate cooking smoke, or you have one in your bathroom to get rid of moist air, try as hard as you can not to use them. Use a fan to ventilate the air out of the room into other areas of the house instead. A vent fan will carry that warm air straight outdoors, guaranteeing extensive heat loss. Close the heating vent in the guest bedroom or any other room in the house that you don’t use very much. This works well if you have well-insulated interior walls – if you don’t, this won’t help much at all, but you may get a slight boost from it. If you spend most of your time in only one room or two in the house, drop the thermostat even lower and put a space heater in that room where you spend your time. It’s much cheaper just to have a space heater heat up part of a room than to have a furnace heat your whole house. Furnace filters are vital at keeping dust out of the passageways in your home, making the furnace work less to keep your home warm (and keeping dust out of the air, too). Along those same lines, ensure that nothing is obstructing your furnace and also get an occasional tune-up to make sure it’s in good working order – once every few years should do it. Here’s some solid information about basic furnace maintenance. Most modern hot water heaters are already well insulated, but many old heaters lose a ton of heat in a very inefficient manner, causing you to waste money heating your utility closet. If you have an older hot water heater, consider getting an insulation blanket for it in order to help it keep the heat inside, keeping your water warm and not losing heat to the environment of your utility closet. If sunlight is coming in a window, you should pull back the curtains and let the sunshine in. Otherwise, keep the curtains drawn, as without direct sunlight you’ll lose heat to the outside even through a well-insulated window. Let the sun be your guide here – if the sunlight’s coming in, open up the curtains. Since it’s cheaper to cook warm meals at home than it is to go out, you should also take advantage of the fact that cooking in your kitchen adds heat to your home. Instead of going out to eat, fire up the oven and make a delicious meal at home. It might burn a bit more energy than you otherwise would consume, but not much more (since your home needs heat anyway), and the inexpensiveness of eating at home versus eating out makes a huge difference in your overall budget. This is a trick I learned from my father, who grew up with a wood stove in his kitchen and no heating in the bedroom. He and his siblings would put a bottle of water on the stove at night, get it very warm (almost boiling), then wrap it gently in a sheet and put it in bed with them, making their cold bed instantly warm. This same technique still works – lower the house temperature about an hour before you go to bed, then get some water boiling in the microwave just before you go (in a tea kettle, for example). Put that boiling water in some sort of sturdy container, wrap it in a pillowcase or two until it’s just nice and warm and not hot, then put it under the covers with you. Instant warm bed!